So wrote a reporter in a faded copy of an unknown newspaper c1920 which forms just one small item in a library of old cuttings and photographs spanning the 1920s to the 1960s, many of them undated and yellowing with age. They make interesting, if wordy, reading, which contrasts with the short, sensational tabloids of today. They report on games of league and county cricket of an age far removed from the helmeted faces and histrionics of the modern game. From them emerges the story of a self-made sportsman who never received an hour’s coaching in his sporting life and who worked in the mines for the whole of his working life. He had, however, a natural aptitude for, and love of, all games - cricket in particular. Aaron Lockett was born in Audley on 1st December, 1892. The local elementary schools provided no facilities for cricket when he was a scholar and he and the village boys would have played on any waste ground as could provide a “pitch”. A small but sturdily-built lad, he played with Audley in 1907, before moving to Bignall End in 1909, probably to improve his cricket, but possibly, as Arthur Burgess suggests in History of Bignall End C.C., for “romantic reasons”. In his first match with his new club, he made 82 for the second team and was promptly promoted to the first eleven. His next eleven seasons, until 1920, were of mounting success, topping the club’s batting averages six times and bowling averages seven times. During these years the winter seasons found him active on the football field. He had played locally with Wereton Q.P. and Kidsgrove Wellington before joining Port Vale, making his debut and scoring against Oldham Athletic reserves in February 1915. During that season he made frequent appearances, but joined Audley when, due to the war, Port Vale went into abeyance. He rejoined them in 1917 before moving to Stoke City and Stafford Rangers. In all he made thirty-four appearances for Port Vale in various competitions and scored 14 goals. His matches with Stoke are listed as being as a “guest” player. Appearing at inside right in 1917/18, together with another Audley footballer, Jack Maddock, he scored a total of five goals. Twelve appearances during the following season brought six goals, including a hat trick and two goals against Port Vale. He was a member of the Stoke team which were champions of the Lancashire Section of the Football League and was the recipient of quite a handsome medal. The end of his football career coincided with his first professional cricket engagement when, in 1920, he signed for Lidgett Green in the Bradford League. During that season he took fifty wickets, but a night shift at the pit followed by a match in Yorkshire, returning to Stoke station and then to Bignall End proved too much, and 1921 saw him playing with Congleton as an amateur, local rules forbidding his immediate return to Bignall End. The years 1922-26 were the golden years of Bignall End C.C. - runners up in 1922 and then champions for the next three successive years. This wonderful achievement by the village cricket team was celebrated by a great tea and concert in Ravens Lane school which merited two full columns of the Weekly Sentinel broadsheet. The club president, Sir Francis Joseph, presented the team with solid gold medals. He greeted the chief guest, Mr Herbert Sutcliffe (Yorkshire and England), and said it was a splendid compliment that he paid them in coming to that little out-of-the-way mining centre of Bignall End. Detailed speeches are interspersed with “hear hear”, “laughter”, “renewed laughter”, “applause”, and none more so than after a spirited rendering of “For he’s a jolly good fellow” when Mr Sutcliffe rose to speak. The evening’s enjoyment, however, was tempered somewhat when Sir Francis announced that Aaron Lockett would be leaving Bignall End to become professional with Old Hill in the Birmingham League. There was a crowd of over 3000 at Old Hill, no doubt in anticipation of seeing Lockett in action after last Saturday’s exhibition. This time he finished with 6 for 24. In three seasons at Old Hill he took 199 wickets. A change in league rules regarding the employment of professionals meant that they had to live within a fixed radius of the club and as, Aaron still lived in Bignall End, he left to join Oldham in the Central Lancashire League in 1929. 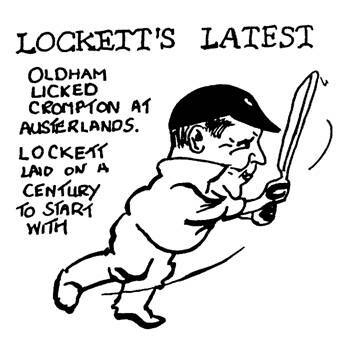 When he arrived at Oldham he was a stranger in a strange land and said he was out to do his best for the club - never has that seemingly simple undertaking been more honourably fulfilled - Lockett’s best has been a very good best indeed. Right arm medium pace, with a command of good off spin and he can employ the leg break too, and always has a quick ball up his sleeve. He has mastered the art of varying his pace and has the brains to put into practice those things which his keen observation tells him are called for. A naturally aggressive batsman with true eye and powerful muscles... crisp leg hitting and hard driving yield him most of his runs. As a batsman he believes in defiance rather than defence. He described himself as, “Always willing to have a go. Hard hitting, that’s what you’d call it.” Thus we read of innings like his 86 for Oldham v. Radcliffe, of which 60 were in boundaries. In 1922, playing for Bignall End against Silverdale, he was carried off shoulder high after hitting 61 in 20 minutes, thereby winning the match. 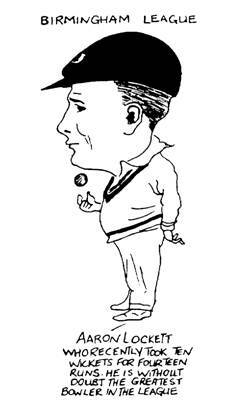 But his greatest innings was undoubtedly for the Minor Counties against the West Indies at Exeter in 1928. There, he made 154 against Test Match fast bowlers Constantine and Griffith. Lockett’s innings, though not faultless, was an immensely brave one and contained some beautiful attacking strokes that made the West Indies fast bowlers spread out their field. Later that week his colleagues noticed that he was black and blue - no helmets and body padding in those days! Certainly the name of Aaron Lockett can be added to that impressive list of men with mining backgrounds who have achieved distinction in sport and who loved to perform in front of hundreds of people who, in the 1920s and 1930s, spent their Saturdays watching their local heroes.